If you are a regular reader of our blog, a skilled practitioner of human-centered architecture, a nature lover or a philanthropist, you are probably already familiar with the concept of biophilia (if you aren’t, I strongly recommend reading our previous post on the topic). Recently, I set myself the challenge of going a little further to explain the mechanisms behind nature’s effect on health and well-being. Recently, I told you about attention restoration theory, which is centered on the impact of natural environments on cognitive performance. In this post, we will look at another theory which concerns nature's effect on a scourge of everyday life with which we are all familiar: stress. Today, more than 50% of the global population lives in cities, and this figure is forecast to rise to over 70% by 2050. Yet numerous studies have revealed that cities are associated with increased risks of mental health issues in comparison to rural areas, including an almost 40% greater risk of depression, double the risk of schizophrenia, and a greater risk of anxiety, stress and isolation1. Why is this? One reason is that we are rarely in a state of physical and psychological ‘rest’ in cities. On the contrary, we are usually in constant motion and continually stimulated by lots of different information and signals: sound, crowds, traffic, smells, lights, etc. When this is combined with pollution, commuting, potential crime, etc., the stress factors are manifold, leading to a growing number of chronic stress situations with a considerable impact on our health and well-being. 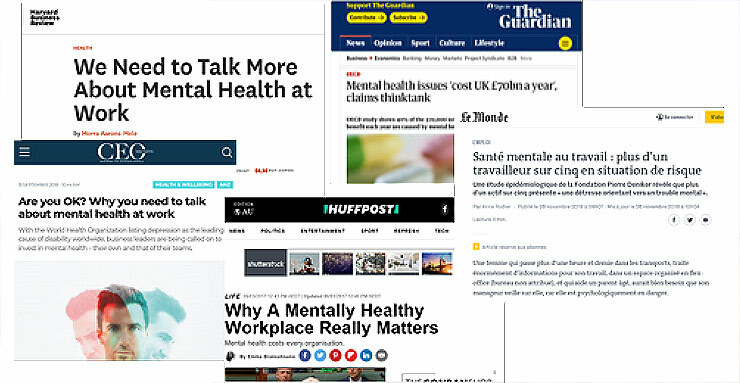 Today, 450 million people worldwide are affected by mental health issues2, costing the global economy $2.5 trillion3, to the extent that they are considered one of the fundamental public health challenges we face this century. Before looking at potential responses to the challenges laid out above, it may be of interest to understand more about what happens from a physiological perspective when we are faced with a stressful situation. Stress can be defined as our body's response to a situation perceived as challenging or threatening to our well-being. 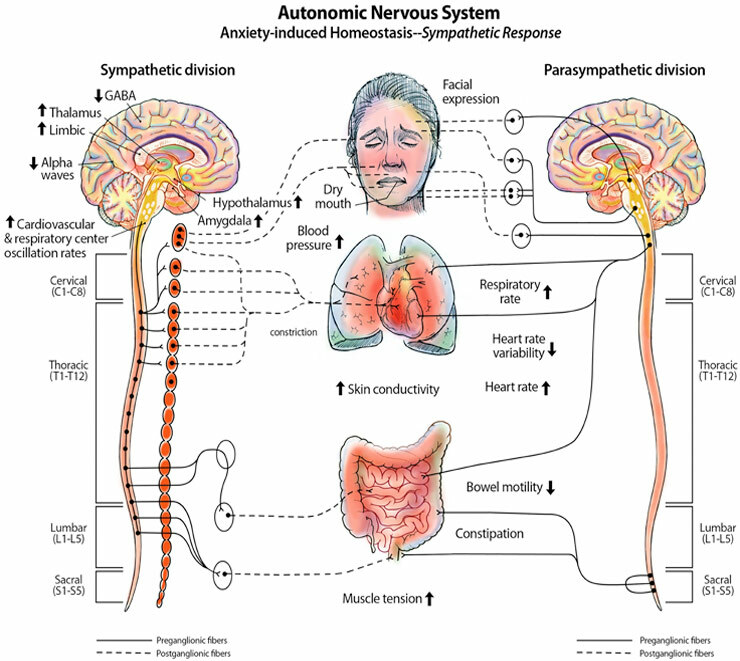 This response is directly linked to our autonomic nervous system (ANS), which is responsible for controlling functions said to be involuntary or visceral, such as heart and breathing rate, digestion, urination, pupillary response, etc. When we are in a stressful situation, our brain reacts and our body enters ‘fight or flight’ mode (via the sympathetic nervous system, SNS), accelerating the heart rate and production of sweat, slowing down the digestive system, activating the secretion of hormones such as cortisol and adrenaline, etc. Once past this stressful situation, our body returns to a balanced state (known as ‘rest and digest’, via the parasympathetic nervous system, PNS), slowing the heart rate, dilating the blood vessels and re-activating digestion, etc7. When the history of mankind first began, this type of response was seen in situations of danger or real threat, such as facing a predator. However, today, and particularly in an urban context, such dangerous situations are no longer the only sources of stress. Our body reacts in the same way to all kinds of stimuli and other sources of stress, such as those described above, thus leading to a chronic state of stress. And the consequences for our health are unfortunately much more serious than if we were faced with short-term, intermittent situations of intense stress. 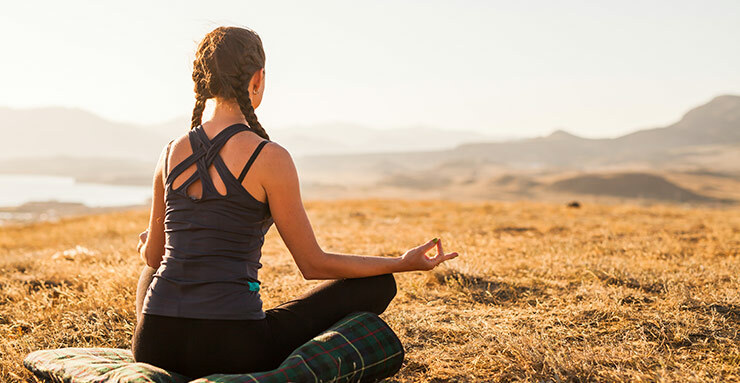 Most fortunately for us, certain environments can help us limit our exposure to stress and the associated mental and physical health risks: specifically, those found in nature. In 1991, the researcher R. Ulrich developed Stress Reduction Theory (SRT), based on numerous studies, notably those carried out in hospital settings, to explain our emotional and physiological reactions in the presence of natural elements8. 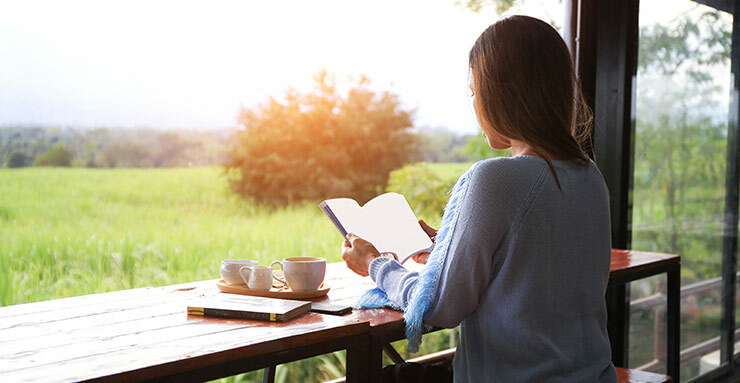 This theory states that looking at scenery containing natural elements like greenery or water creates positive emotions and feelings like interest, pleasure, and calm, and has a restorative effect, easing our state of alert following a stressful situation. Our response is then improved rapidly and spontaneously9. Belief in the restorative and therapeutic effect of nature in alleviating the harmful effects of the city goes back many centuries. For instance, as far back as in ancient Rome, people already noted that contact with nature could be beneficial in dealing with noise and urban congestion10. More recently, Ulrich’s theory has been supported by many empirical studies conducted on people in hospitals11, prisons12, residential communities13, offices14 and even schools15. 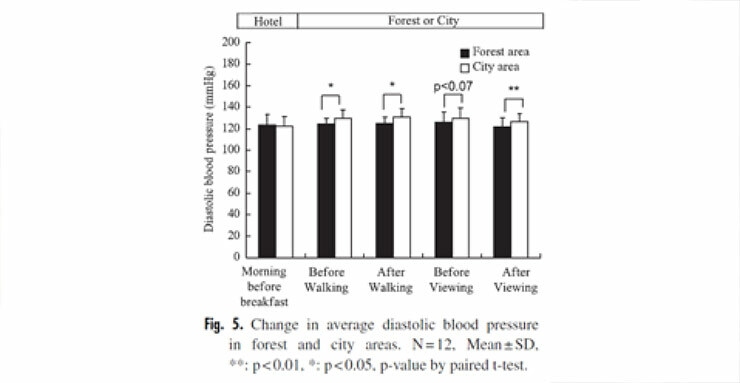 The results demonstrated the beneficial effect of visual exposure to nature in the very short term on reducing blood pressure, heart rate, cortisol levels, sweating of the hands, muscle tension, etc., which are all markers of an improvement in our parasympathetic nervous system activity. Positive psychological effects on mood, anxiety levels and feelings of comfort and relaxation were also measured and observed. 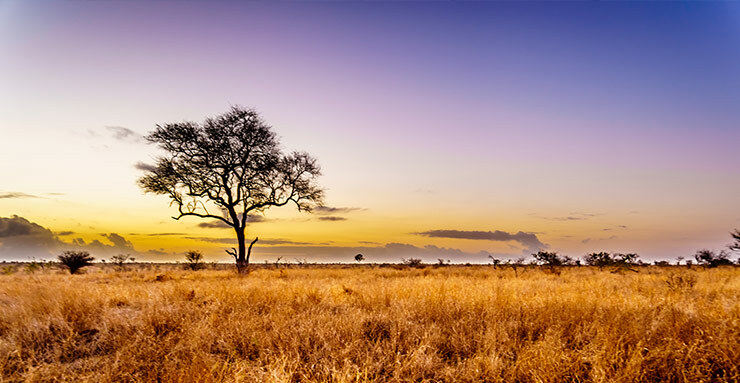 The benefits of nature described above may be explained in the evolution of human kind, making Ulrich’s stress reduction theory what is also known as a ‘psycho-evolutionary’ theory. For the majority of its existence, mankind lived outdoors. We moved into cities and inside buildings just a few centuries ago. As our bodies were unable to adapt to this new environment in such a short space of time, we are said to have maintained our inherent affinity towards nature (known as Biophilia ), as well as a predisposition to respond positively to ‘savannah’-type natural environments, including components that likely favored our ancestors’ survival: water, uniform grassy ground cover, indicating potential sources of food, canopy trees, caves and rocks offering places of refuge and vantage points when faced by dangers and potential predators, and a certain visual depth and complexity7,16. As this type of environment contributed to the well-being and survival of early man, looking at them is said to inspire feelings of pleasure and calm in modern man, helping us block out negative emotions and distract ourselves from sources of everyday stress. In conclusion, it is now recognized, based on scientific proof, that living and working near green spaces, with views of water and plant life, may significantly help reduce stress and improve our quality of life and health. And if your home or office isn't right in the middle of Yosemite National Park or beneath the Iguazu waterfalls, you shouldn’t lose heart! If you live or work in a city, there are already tangible benefits to being around ponds, rivers, trees and plants, whether in parks, squares, gardens or paths, or even built into the roofs or façades of building17. 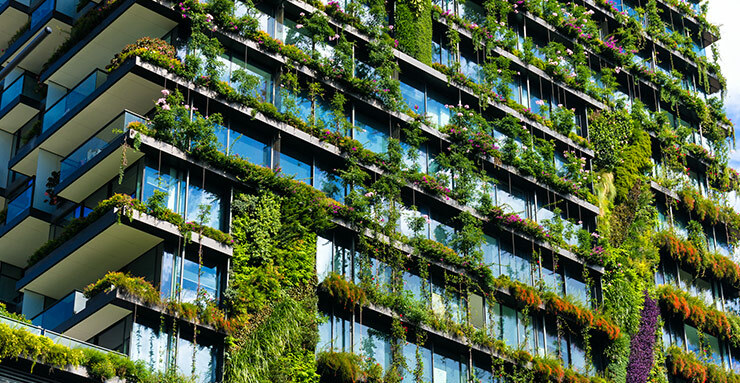 And here’s the good news: as mentioned in the previous post on nature’s benefits for our attention span, inclusion of greenery and biodiversity is on the rise in new building and development planning, for environmental and public health-related reasons. Over the past few decades, we have thus seen so-called ‘therapeutic’ gardens springing up in healthcare establishments (particularly in the United States), with the aim of reducing anxiety, symptoms of depression and the need for pain relief, as well as improving patients’ quality of life and sleep, as seen in previous studies18. These gardens also enhance the experience and well-being of visitors and care staff, who can also enjoy looking at or walking in them. Residential properties with a view of nature are generally in high demand and cost more19 This is also true in the hospitality industry, where hotel rooms with a sea view, for instance, are the most expensive20. In office buildings, biophilic design has also become a key trend: maximizing views of outdoor green spaces from workstations, including atria and indoor gardens, plant walls, are all strategies used to promote employee well-being, satisfaction and productivity21. In all these instances, large windows are key to giving occupants a pleasant and continuous visual connection to nature from indoors (where, it must be noted, we spend 90% of our time), thus facilitating recovery from stress. At the same time, they also let in natural light, which, in regulating our biological clock, also has a therapeutic benefit. At the same time, it's important to control this light, in order to avoid glare and uncomfortable temperatures. That being said, you should spend a little time outside walking and enjoying the fresh air, both of which are also essential for maintaining your health. And if all that wasn't enough, you can sign up to the National Geographic channel to continue contemplating nature during your downtime. 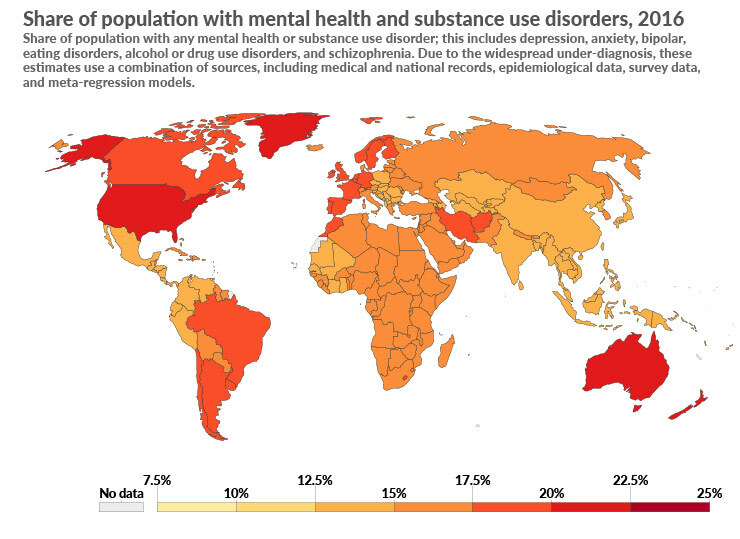 3 S. Trautman et al, The economic costs of mental disorders. Do our societies react appropriately to the burden of mental disorders? 10 Wolf, K.L., S. Krueger, and M.A. Rozance. 2014 Stress, Wellness & Physiology - A Literature Review. In: Green Cities: Good Health (www.greenhealth.washington.edu). College of the Environment, University of Washington. 18 C.C. Marcus, Healing Gardens in Hospitals, Volume I, Issue I: Design and Health, January, 2007. 19 R. Kaplan, The Nature of the View from Home: Psychological Benefits, Environment and Behavior, 2001.